Have you been dreaming of having a brand-new luxury bathroom designed and built at your home in Mesa, Arizona, or a nearby area? If so, you have come to the right place. 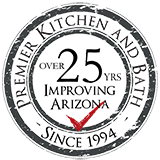 Premier Kitchen & Bath is a specialty interior remodeling firm with a staff that offers more than 150 years of collective design and remodeling experience. Our expertise, along with our strong commitment to customer satisfaction, has earned us an A+ rating with the Better Business Bureau and a spot on the Top 500 Remodeler list by Qualified Remodeler magazine. To have a new luxury bathroom designed and built for your home in Mesa, AZ, or a surrounding area, contact Premier Kitchen & Bath today. One of our knowledgeable representatives will be glad to assist you.